The Montgomery class were ordered in 1888 and commissioned in 1893-94. Of questionable military value, they were slow, lightly armed and protected, to the point it was said the Congress only authorized a class of “glorified patrol gunboats”. Therefore they were barely engaged in the war against Spain and left only a footnote in US Naval history as a one-off savvy concept. The Montgomery class of cruisers were developed at a time the first steel-hulled vessels were created to keep pace with Europe. Also, there was no prospect of war then, the Congress spared funds for three “peace time” vessels on request of the navy department. With the 1888 naval appropriation bill this translated into a lightly-armored (if any) ship designed like a large gunboat for overseas stations. These cruisers called for innovative solutions in order to maximize protection with little was available. In fact the next year in 1889 the Department of the Navy submitted to various yards specifications for a less than 2000 tons, and $700,000 apiece ship. Bath Iron Works and William Cramp & Sons bids were over limits, so new specs were issued, reducing the original optimistic speed from 18 to 17 knots, but still with sanctions for half-a-knot not met in trials, and construction time extended to two years and a half. Eventually this new bid was more realistic and had more success, with proposals from Union Iron Works (San Francisco), N.F. Palmer Jr. & Co (New York), Quintard Iron Works, Columbian Iron Works (Baltimore), City Point Iron Works (Boston). Eventually Columbian Iron Works won two cruisers at $612,500 apiece (Montgomery, Detroit) and City Point Iron Works (Marblehead) for $674,000. Their tonnage, standard, was 1085t, so less than fleet destroyers of WW1. Their dimensions, 62 meters by 4,66 by 4 (draught) did not allowed much as armament. Indeed they carried six 5 in (120 mm), guns and four 3 in (76mm) plus two 1-pdr (37 mm) QF guns. They were just fast enough to insert in a battle fleet but barely to be used as scouts: With two VTE and Babcock et Wilcox engines for 5400 hp and 17 knots, they were just able to screen battleships. The first cruisers were laid down in February and October 1890, launched in October and December 1891 and Marblehead in August 1892, to see service in late 1893 to 1894. The ships were not bristling with guns and their artillery was limited to deal with other gunboats and light ships. In cas of an encounter with a modern light cruiser, must faster they would not stand any chance. The main armament initially comprised two 6 in (152 mm)/35 caliber Mark 3 rapid fire guns fore and aft for the ship, plus eight 4 in (102 mm)/40 caliber RF guns on the sides. But this was prior revision, due to suspicion of poor stability, and 5 in (127 mm)/40 caliber Mark 2 RF guns replaced the 4-inch guns on paper while only Detroit was completed with her original 6-inch guns. The usual specs calls for an all-5 in armament. USS Detroit indeed own 6-in guns were removed in 1894 as stated in a Navy register. In 1895-96 Montgomery and Marblehead each received an additional 5-inch gun on the forward deck. By 1897 finally all ships had an uniform battery of ten 5-inch guns. Secondary armament comprised six 6-pounder (57 mm – 2.2 in) RF guns, and two 1-pounder (37 mm – 1.5 in) RF guns. Not registered in the specs sheets below were also a Gatling gun for land parties, and three 18 inch (450 mm) torpedo tubes. The three ships had the same six coal-fired cylindrical boilers, feeding two vertical triple expansion engines (VTE) for a total of 5,400 ihp (4,000 kW). The contract speed of 17 knots (31 km/h; 20 mph) was met on trials and per ships varied from 18.44 knots (34.15 km/h; 21.22 mph) to 19.05 knots (35.28 km/h; 21.92 mph), thus ensuring contract bonuses for the builders. But it was paid in protection. The ships carried 200 tons of coal, enough for a 3,280 nmi (6,070 km; 3,770 mi) range at 10 knots cruise speed (19 km/h; 12 mph), up to 340 tons (8,952 nmi) in case of war. Certainly the most interesting part, protection was designed to meet minimal requirements and maximizing what was available, also choosing rather innovative solutions. Protection was indeed limited to a protected deck and conning towers. The protective deck was identical to most protected cruiser, with 7⁄16 in (11 mm) sloped sides, 5⁄16 in (7.9 mm) on the flat section. It was not compensated by a batle of lower cofferdam heavy steel protection, therefore was detrimental to stability. Indeed, instead of this, coal bunkers were added to a cofferdam of “Woodite” (cellulose) were used, maing these ships “coal-protected”. The conning tower on the other hand was protected by 2 in (51 mm) of steel. How this “peace cruiser” concept fared in real life ? These ships has been primarily design for “showing the flag” in distant stations, not for the battle fleet, and in that respect could do little in tims of war. 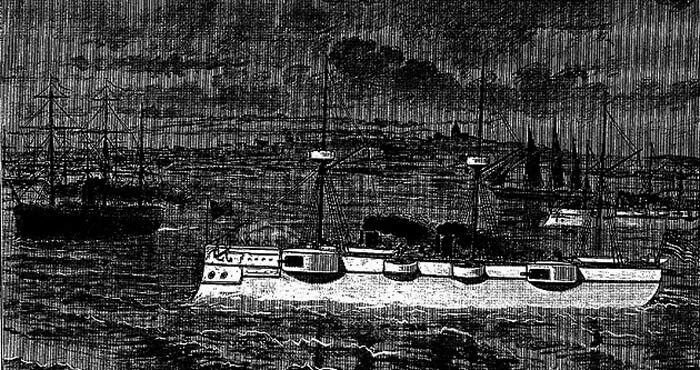 In fact their only wartime actions consisted in shore bombardment in the Spanish–American War when the situation was stabilized of any Spanish threat. Commissioned in July 1893 (Detroit), April 1894 (Marblehead) and June 1894 (Montgomery), they served in the Atlantic, Caribbean and European waters. All three cruisers were decommissioned in 1900, to be recommissioned two years later. Detroit and Marblehead in 1901–02 had their torpedo tubes removed. USS Detroit served to protect American citizens and interests during unrest in Brazil. She also was stationed later in the Asiatic Station. She served in the Spanish-American war, shelling San Juan and Puerto Rico. 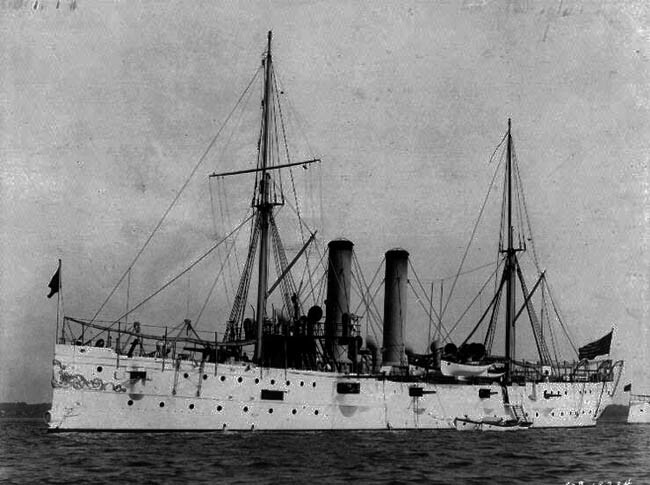 USS Detroit added her guns in support to diplomatic talks, resolving an the Dominican Republic 1904 insurgency. She was decommissioned in August 1905 and sold for scrap in December 1910, the only one not seeing service in WW1. USS Marblehead shelled Cuba and blockaded, then captured Guantánamo Bay with other ships. 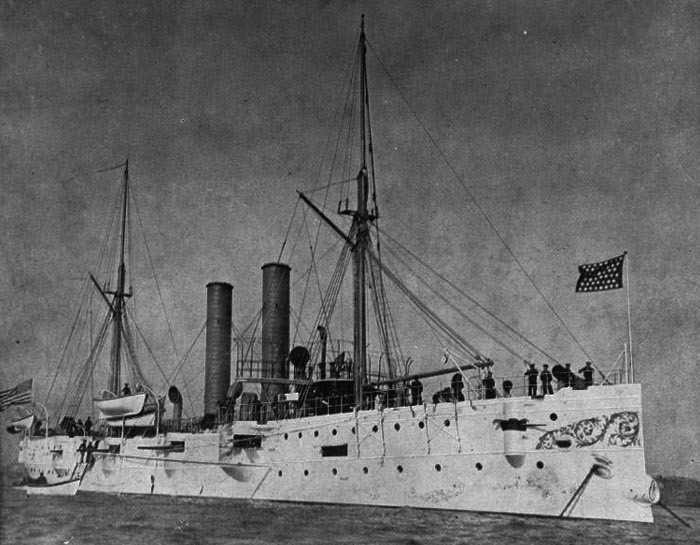 USS Marblehead was later stationed on the Pacific station, mostly showing the flag onthe South-American coast. 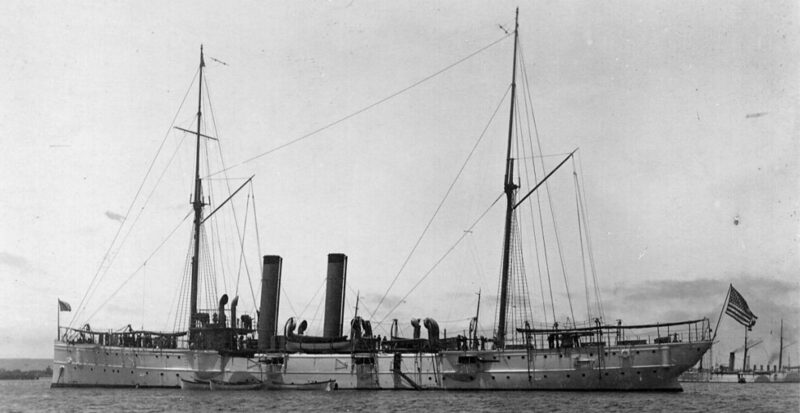 USS Marblehead was refitted as a training ship for the Oregon Naval Militia in 1915. She carried then eight 4-inch/40 caliber guns. She was eventually decommissioned in August 1919 was ultimately redesignated rightfully as gunboat and redesigned PG-27 in 1920, only to be sold for scrap in 1921. Montgomery blockaded and shelled Cuba, also capturing two Spanish merchant vessels. 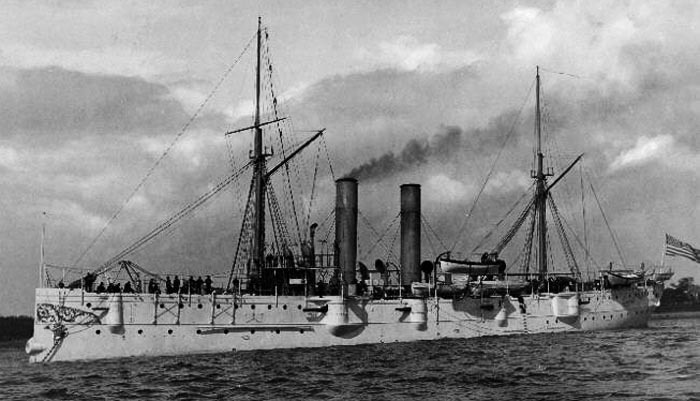 USS Montgomery was converted to a torpedo test ship 1904–1908. She carried all the torpedo tubes types in use in the Navy until 1914. She was further refitted as a training ship for the Maryland Naval Militia. In this new role she carried four 4-inch (102 mm)/40 caliber guns plus four torpedo tubes, two 18-in and two 21-in and was reboilered with six modern Almy boilers in 1918. Lastly, she was recommissioned for coastal patrol in WW1, renamed USS Anniston. She was eventually sold for scrap on 14 November 1919. 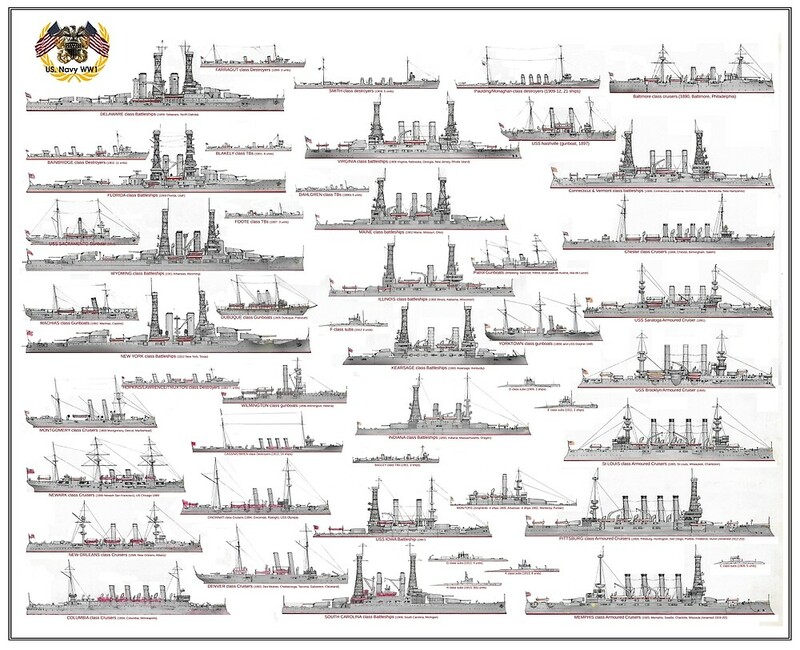 Support Naval Encyclopedia and help it to grow !